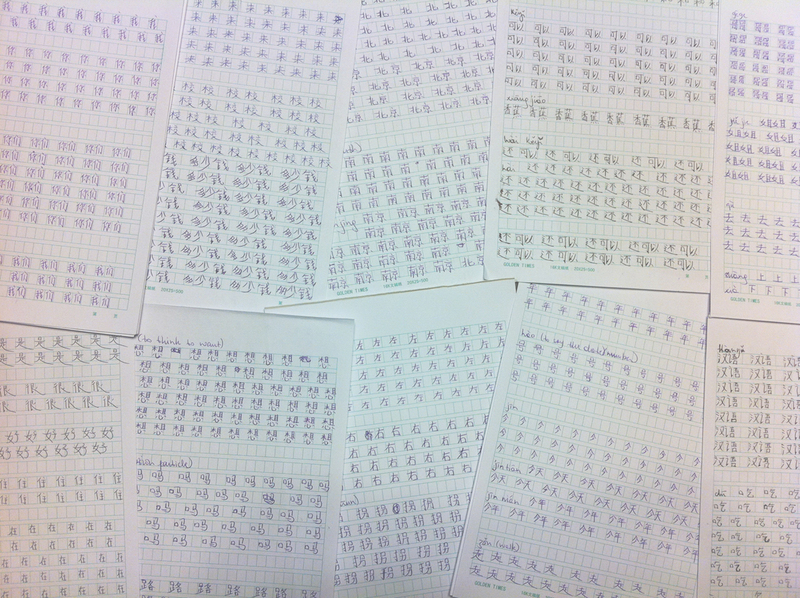 I have come a long way since my post titled “Zhōng wén” as I can now write ONE HUNDRED Chinese characters!!! Yes, I can! This means more than one hundred words as each character is a word of course, but combining characters make other words. 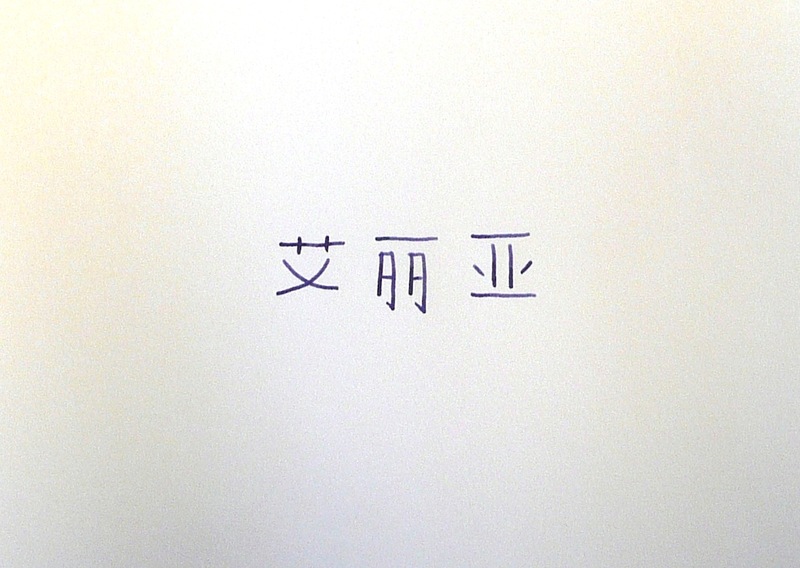 At the time I wrote the “Zhōng wén” post (November 2011), I was seriously discouraged about being able to write Chinese. Soon after, I decided to persevere and took a more methodical approach. 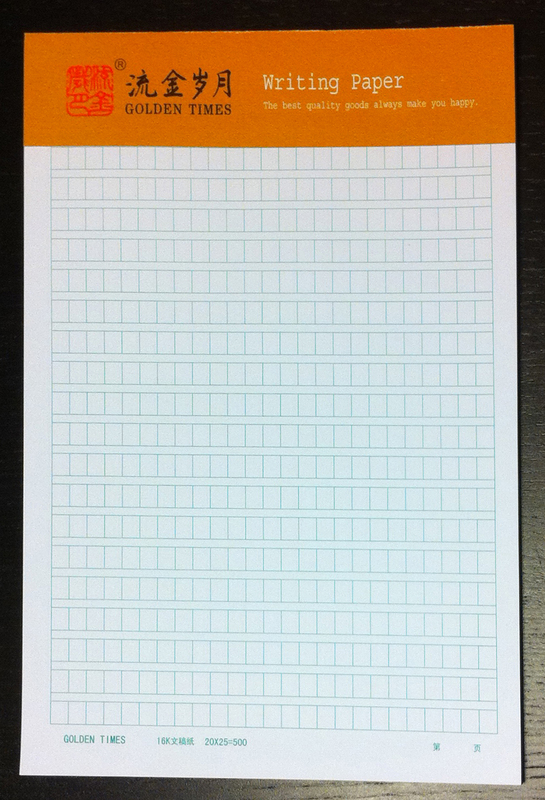 I bought the special Hànzi (Chinese characters) gridded pads and started with the basics: I, you, he/she, it, we, you, they, to be, to have, father, mother. Then I learned characters that would enable to make sentences, in order to write more intelligible stuff and remember characters more easily. 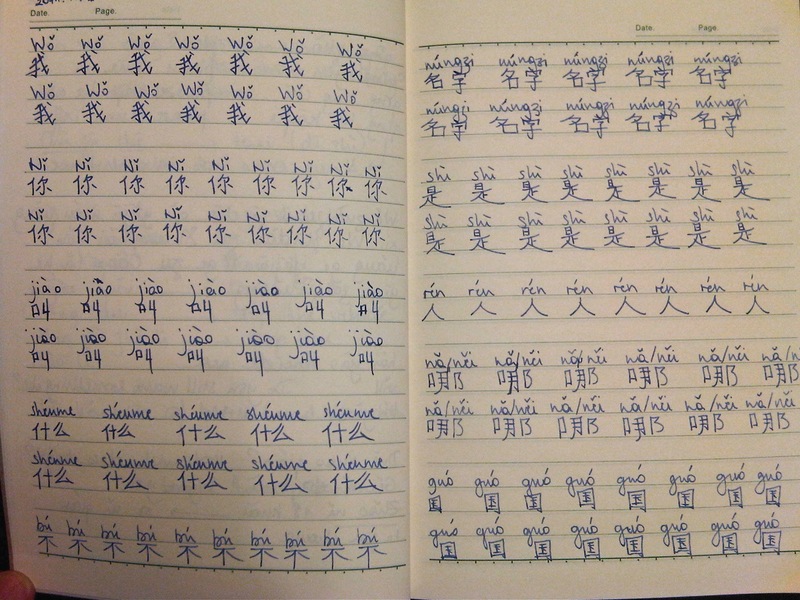 My first sentences were: “My father and mother do not live in China”, “Hello/How are you?” (same thing in Chinese “Nǐ hǎo”, literally “you good”), “Very good and you?”. Over time, it got a bit more elaborate: “Are you hungry? I’ve got an apple and a banana.”, “Are you thirsty? Would you like to drink tea?” or “His older brother is a teacher.”, “Too expensive!”, etc. When I browse through my books to pick on the next characters to learn, I become very choosy. No not you, you look very unsympathetic, not you either you’re too complicated. You’re not too bad, but not very inspiring. I don’t need to know you now, you don’t fit with my sentences. You sound exactly like the other one I know, you’re going to confuse me. Ah, you look alright, likeable and useable. You too and you too! Although a hundred is not much and I have to pace the learning because I need to do repeat sessions before getting on with new words, it has become slightly obsessive. On the streets, I keep trying to decipher shop fronts, advertising boards, etc. and get very excited when I can. 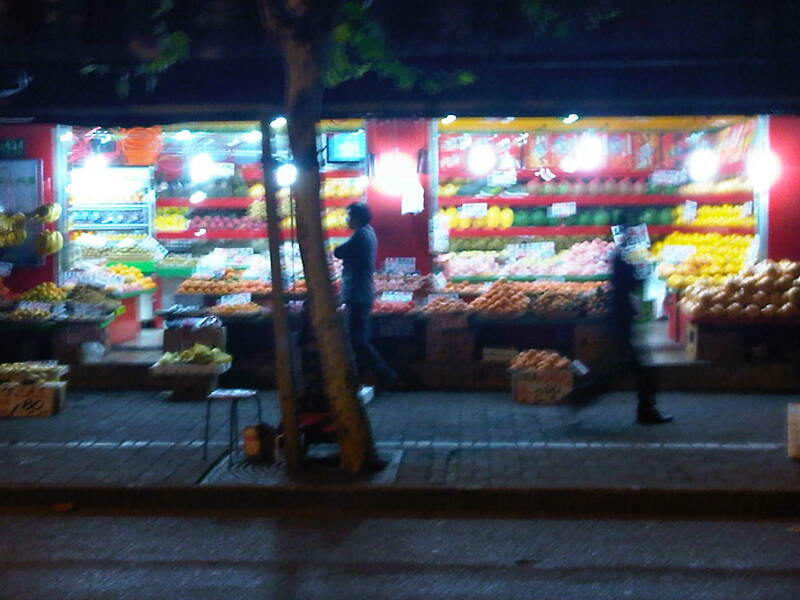 Fruit shops are very sweet here in Shanghai. There are plenty of them around town and at least three near my flat. They only sell fruits and, every once in a while, you think you may have spotted vegetables but those are technically fruits, like tomatoes or avocados. Anyway… I find them extremely sweet for several reasons. First, the fruits are always so impeccably displayed and vendors have a real feel for colours. Striking out are the yellow of pomelos, the soft orangey-pink of grapefruits, the unambiguous orange of oranges and darker orange of tangerines, and then, taking over, the spectrum of reds of apples, to finish with the amazing fuchsia of the dragon fruit. Second, they’re open late, very late sometimes and, with their characteristically open frontage, they brighten the street with their energy-saving light bulbs and colours, when shops around have shut down or when people rush back home. Finally, it always feels like they constitute a small hub of family or even community activities, during both daytime and nighttime. 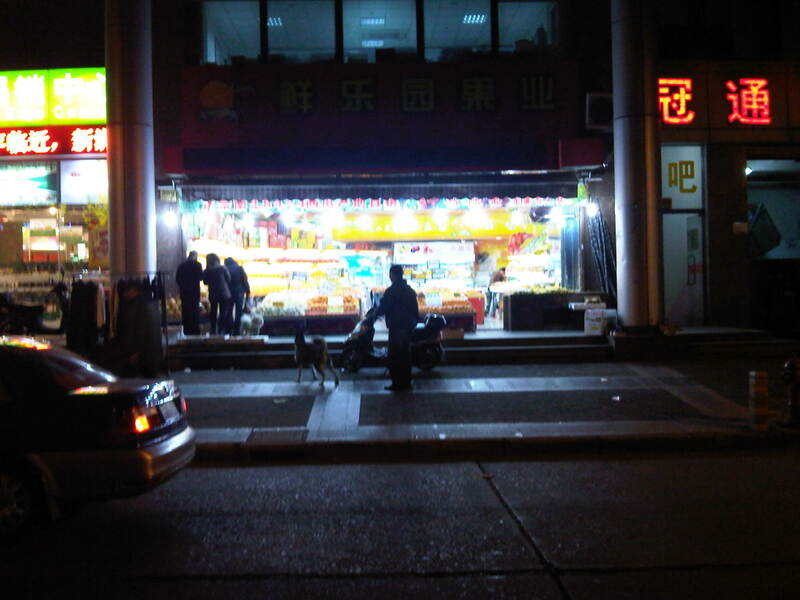 Because the shop is permanently open onto the pavement, the grand-mother, mum or whomever sits opposite, peels some vegetable, feeds the baby or teaches a toddler how to walk. 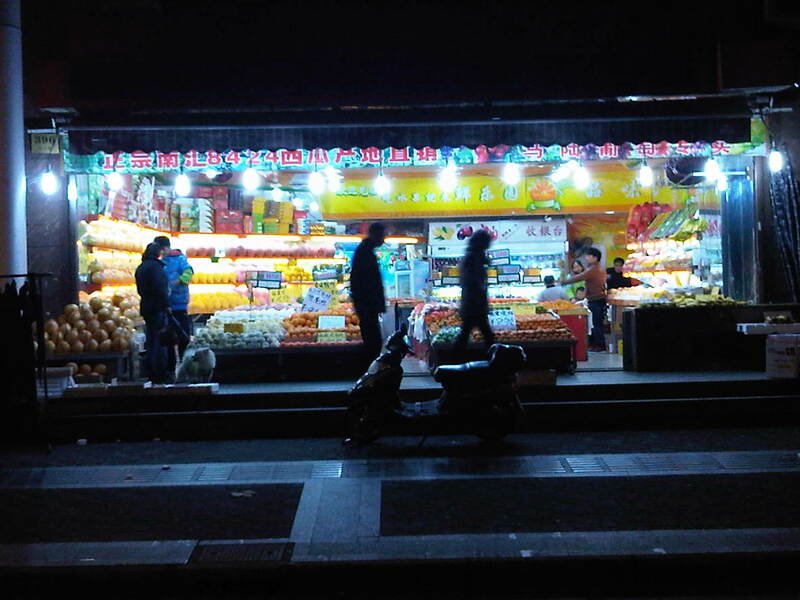 Older kids run around naughtily and customers buy their fruits while walking their dogs. 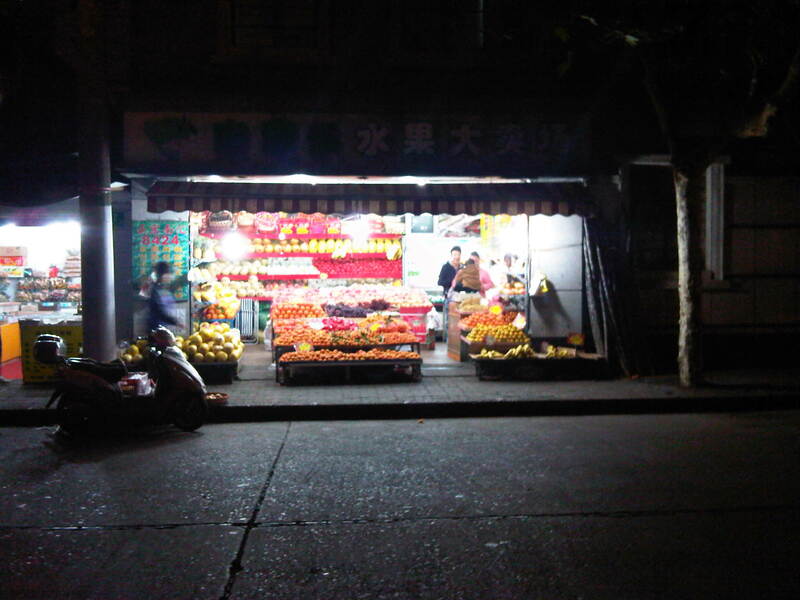 I’ve chosen my favourite fruit shop somehow randomly but I’ve decided to be exclusive to it as a strategic measure to start knowing the local community outside my compound and, perhaps more importantly, to practice my Mandarin. The guy I assume to be the main shop owner turns out to be very nice and sympathetic to my linguistic efforts. He gave me a sincerely amused but polite smile when, instead of asking for píngguǒ (apples), I asked for péngyou (friends).